Pura Uluwatu is located at the southernmost tip of Bali island, in western Pecatu Village, Kuta District, Badung, or is about 30 km from Denpasar. Pura Uluwatu is "stana" of Ida Sang Hyang Widhi Wasa in its manifestation as the god Rudra, or who is called Sang Hyang Maha Jaya. In the Lontar Usana Bali manuscipt mention, Uluwatu Temple built by the Mpu Kuturan in the 11th century AD, during the reign of King Masula Masuli in Bali. Dwijendra Tatwa manuscript also mentions Luhur Uluwatu Temple is closely related to the arrival of Dang Hyang Nirartha to Bali in the 14th century AD in this area. Temple is located at the southwestern tip of Bali island over the stone bridge and a high cliff jutting into the sea and this is the Temple of Heaven Sad which is believed by Hindus as a buffer from 9 of the wind. This temple was originally used to be a place of worship a holy priest named professor Kuturan 11th century. He lowered the teachings of Indigenous Village with all the rules. This temple is also used to worship the holy priest that followed, namely Dang Hyang Nirartha, who came to Bali in late 1550 and end the journey with the so-called sacred Moksah / Ngeluhur in this place.The word is at the origin of the name Luhur Pura Uluwatu. 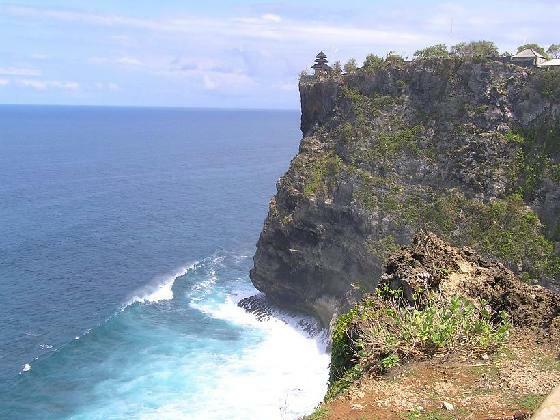 Uluwatu Temple is situated at an altitude of 1997 meters above sea level. In front of the temple there is a small forest called kekeran base, serves as a support of the sanctity of the temple. The main Pelinggih Pura Uluwatu is an overlap of three or Meru Meru three-story, stana from Ida Sang Hyang Widhi Wasa in its manifestation as the god Rudra also called Sang Hyang Maha Jaya. Pengempon Pura Uluwatu is Pecatu Indigenous Village residents. Pujawali or piodalan Ceremony at Pura Uluwatu Luhur, fell on Tuesday Kliwon Wuku Medangsia according to Balinese calendar. Uluwatu Temple has some "Pura Pesanakan", which is closely related to the temple that the temple master. It is Pura Pura pesanakan Bajurit, Pererepan Pura, Pura toadstool, Pura Dalem Pangleburan Selonding and Pura Dalem. Each temple has close links with the Pura Uluwatu, especially in the days of his piodalan.Piodalan at Pura Uluwatu, Pura Bajurit, Pura Pura toadstool Pererepan and fell on Tuesday Kliwon Wuku Medangsia every 210 days. Manifestation of God who was worshiped in the Pura Uluwatu is the god Rudra. Luhur Pura Uluwatu is one temple in Bali with a beautiful location.The main attraction for tourists is a view of the temple is spectacular. Located in the northwest, such temple is perched on the tip of a very high rock cliffs and steep, with views of the sea under a blue net and hit the waves that produce foam-white froth that is very beautiful. Uluwatu Temple became famous for his right under it is a beach Pecatu often used as a place to surf sports, and even international events are often held here. This beach is very famous waves suitable for surfing to be a place other than the natural beauty of Bali is indeed very beautiful. To gain entrance into this temple visitors must wear a sarong and sash that can be rented on the ground. The best time to visit Uluwatu Temple is late afternoon when the sun goes down so they can watch spectacular scenery. Tembahan information, around the temple complex there are a bunch of monkeys. The monkeys are usually rather bothered to take various kinds of goods that brought visitors. Goods are often the target of their glasses, bags, whatever dompetatau easily captured. So be careful with them when visiting Bali in Uluwatu Temple complex.